Last.fm is one of the best way to discover and log your music listening history, but its radio service has been in decline for some years now. 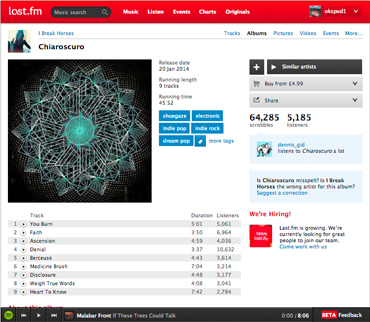 All that is changing with the latest partnership between Last.fm, Spotify and YouTube. Spotify users can now use the unlimited streaming service to play music right from Last.fm’s web pages. There’s also a You Tube radio player – probably set up in order to cover those locations where Spotify does not have the license to play music. Whether it be your own profile page, artist pages or album pages – if Spotify has it, you can play it and control it on Last.fm via the Spotify playbar at the bottom of the screen. Using your Spotify account (premium or free) you can listen to any track simply by pressing the play button. This will load all tracks on a Last.fm page as a playlist in Spotify. With 20 million songs at your disposal and You Tube videos, it’s going to be hard to beat this streaming option when combined with Last.fm’s music data collection, which provides one of the best music discovery experience anywhere. Perhaps the music website should consider adding Bandcamp to cover independent artists.